Fixed-price projects. Fixed-price projects are automatically marked complete once your bid amount is paid in full. Hourly projects. Hourly projects have to be ended manually by your employer before they are marked complete. Feel free to ask your employer for the project’s completion after your submitted work is reviewed and paid for. Contests are completed after both parties finish the Contest Handover, which also means that the contest prize money has been released to the winner. Both you and your employer will have the opportunity to leave each other feedback once your project or contest is completed. The feedback will include a 1 to 5 star rating, as well as a comment about your experience on working with each other. Leaving feedback is optional, but each review that you receive is an opportunity for you to build your reputation and credibility as a freelancer on the site. Communicate clearly and on a timely manner. Maintain a professional relationship with your employers throughout the project. You will see the summary of your received reviews from all completed projects and contests on your profile page. The overall star rating is the average of all the star ratings you received. The Jobs Completed is the percentage of the projects you have successfully completed versus the total number of awarded projects you accepted. The On Budget and On Time percentages reflect your previous employers’ feedback on whether or not you completed their projects for the agreed price and on the agreed deadline. The Repeat Hire Rate shows the percentage of your rehires from previous employers. The higher your stats, the better your reputation would be for potential employers. The Preferred Freelancer Program pools the best talent on Freelancer.com, creating a community of elite freelancers whom we call Preferred Freelancers. If you get accepted into the program, you will receive exclusive invitations to work on high-value projects, and you will get the Preferred Freelancer badge to make your profile stand out, among other perks. Keep on satisfying employers by providing quality work, by communicating punctually, and by maintaining professional relations to help you meet the minimum requirements to apply for the program. To preserve trust and respect on Freelancer.com, we have set community standards which are also the best practices we have observed from successful freelancers. 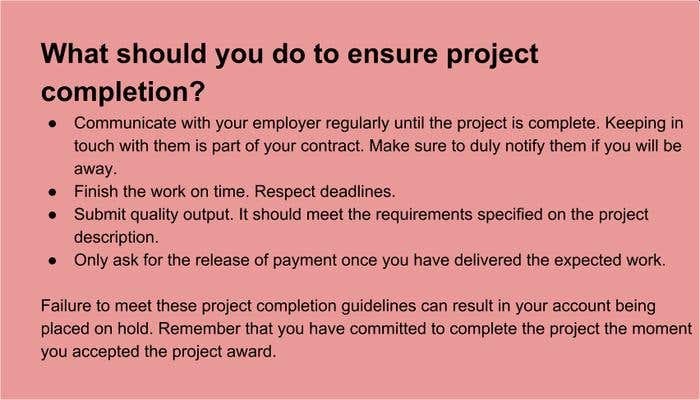 Get in touch with your employer closely until the project is complete. The key to project success is clear and timely communication. Maintain your communication and payment within the platform. This will help ensure that you will get paid for your hard work using our Milestone payments. Impress employers with quality output. This is the best way to get good reviews. The better your reputation, the higher your chances of earning big. Provide true and accurate information. Starting from your profile details to your bid proposals, show your employers that you can be trusted. Look out for projects that are in violation of the site terms. Avoid projects that require you to send money offsite, to give out your personal / contact details, and to bypass security checks, among other potentially dangerous activities. In the unlikely event that you encounter one, let us know.